Marketplace repricing tool Informed.co now includes Amazon referral fee discounts in calculations for profit and min and max prices. Amazon has given Informed.co access to incorporate referral fee discounts into their reporting. The update allows them to fully support referral fee promotions for eligible items (e.g. grocery items $15 or less, specific ASINs sent by Amazon, etc.). Fee discounts are when Amazon offers to provide a discount on certain fees if you price your listing to a certain price point. These fee promotions are provided solely by Amazon and are only for eligible listings for a limited period of time. For example, Amazon may offer a 9.2% referral fee discount for an item as long it has a sale price of $77.99 or less. The fee discount will also have an expiration date that is provided by Amazon for when the fee promotion will no longer be valid. Marketplace repricing tool Informed.co has a new integration with Amazon inventory management tool InventoryLab. The integration allows Informed.co to automatically import product costs from InventoryLab, so they do not have to be inputted manually. Product costs are used to calculate the minimum selling price on Amazon, so are a crucial data point for a repricing tool. Costs automatically sync from InventoryLab to Informed.co once per day. Costs already set in Informed.co will be overridden by values set in InventoryLab unless the InventoryLab cost is zero. Marketplace repricing tool Informed.co has launched a new feature to help Amazon sellers boost profits on out of stock items. The new setting gives sellers the option to have listings go to their max price when they run out of stock. If the seller updates the max price while out of stock by raising or lowering it, the listing will go to the new max price. Once back in stock, the listing will revert to the seller's usual pricing strategy. Marketplace repricing tool Appeagle has launched a new name and brand identity. It is now called Informed.co. Existing users will see a fresh new look and feel to the software, but with all the same advanced repricing strategies. In the future, they will be adding more reports, with insights and recommendations that can be understood and acted upon quickly. The result will be a powerful new platform with seller analytics to help online merchants find more opportunities to grow. Marketplace repricing tool Appeagle has a special discount offer running until December 31, 2017. Appeagle is offering new and returning customers 30% off their first 3 months of automated repricing, after the 14-day trial. The offer includes promo codes for more than a dozen Amazon selling tools and services from other companies, including a $100 credit from WorldFirst, 10% off Refunds Manager, 27% off Jungle Scout, 50% off a month of Jump Send, Splitly, and Fetcher, 30% off Ecomdash for three months, $50 off Scope, 60-day trial of Feedback Genius, one free month of SkuVault, 30 days of free refunds from 71lbs, 25% off 2 months of Forecastly and 10% off a TaxJar annual plan. Go to Appeagle for the details. Terms and conditions apply. Marketplace repricing tool Appeagle can now automatically reprice products for sale on Walmart.com. Walmart's online sales grew by 29% last holiday season, yet the number of marketplace sellers is much lower than on Amazon. Appeagle is one of only a few repricers currently available for the Walmart Marketplace, and has been chosen by Walmart as a Preferred Partner. To celebrate the new integration, Appeagle are offering new customers who sign up before the end of June 20% off their first 3 months. More information. Marketplace repricing tool Appeagle has integrated with ecommerce ERP Skubana. Sellers who use both applications can easily link them, then Appeagle will automatically pull cost prices from Skubana and use them to calculate minimum and maximum prices for every listing. Fees are taken into account, and the min and max price calculations can be further customized on a per-SKU basis. Once linked, Skubana will continuously update cost prices so Appeagle can recalculate min and max prices. Marketplace repricing tool Appeagle now works with the Amazon marketplace in Mexico. The new feature is open to all Appeagle users without an additional fee. Amazon Mexico was launched in June 2015, and is easily accessible to sellers on Amazon USA and Canada using a unified North America selling account. Amazon's FBA fulfillment service delivers to 99% of Mexico's zip codes. Mexican online buyers are predicted to grow from 8.4 million in 2013 to 18 million in 2018, an increase of 114%. Amazon and eBay repricer Appeagle can now adjust repricing rules based on competitors' handling days and product availability. Handling days, which is expressed as a range, is the number of days it takes for a seller to ship an item after an order is placed on Amazon. Appeagle's new handling days feature enables sellers to exclude competitors based on the number of handling days it takes them to ship an item. It is possible for sellers to win the Buy Box at a higher price than competitors who take longer to ship orders. Appeagle can also now exclude competitors with backordered Items, which avoids repricing against sellers who are out of inventory but still listing an offer. Marketplace repricing tool Appeagle has added a new feature which can selectively ignore competitors on Amazon listings. The new Ignore Competition setting allows sellers to more accurately define the type of sellers they'd like to compete against, remaining competitive while keeping prices above a minimum threshold. Instead of staying at their minimum price when there are cheaper competitors, the Ignore Competition feature can be used to beat the next-cheapest competitor above the seller's minimum price - ignoring competitors who are cheaper. The Ignore Competition feature is available on all three of Appeagle's pricing plans: Basic, Premium, and Enterprise. Amazon and eBay repricer Appeagle has adjusted their entry-level price plan to allow repricing on multiple marketplaces. Appeagle's Basic Plan now allows price management on one selling account for each marketplace, at no additional charge. Prior to this enhancement, the Basic Plan allowed for repricing on a single marketplace among those supported by Appeagle. Users can now can manage pricing on one marketplace per country on any of the Amazon international, eBay international, and Rakuten.com marketplaces. This change ties into Appeagle's globalization initiative to help sellers expand their businesses across borders and sell globally. Sellers can assign all listings across marketplaces to pre-existing pricing strategies, and manage inventory across marketplaces using Appeagle's Quantity Sync feature. Inventory and marketplace management solution Ecomdash is integrating with repricing tool Appeagle to provide an automatic feed of pricing information. Pricing strategies will be definied as normal in Appeagle. Ecomdash and Appeagle will communicate pricing rules. Then minimum and maximum prices can be set in ecomdash, and automatically communicated to Appeagle. A free webinar on Tuesday, October 27th at 2 PM EST will introduce Appeagle to ecomdash customers. Marketplace repricing tool Appeagle has a redesigned customer support center. All of the articles from the old Help Center have been migrated and enhanced, and a new Appeagle 101 section and repricing glossary added for new users. Check out the new Appeagle Help Center. Marketplace repricing tool Appeagle has upgraded their technology to make searching for products up to seven times faster. The Appeagle search function now uses Amazon's CloudSearch technology, meaning searches happen externally on the cloud, in as little time as 0.5 seconds. The new search also includes prefix matching so a seller can look up SKUs that begin with specific digits, and a special syntax allows searches just within SKUs or titles. The latest version of automatic repricing tool Appeagle includes pre-configured strategies for sellers to choose from. The new strategies help new users learn the software, by choosing from pricing approaches such as Match Featured Merchants which allows sellers to compete only with Featured Merchants. Appeagle's Co-founder Aaron Cohen said, "The challenge is making the enhanced software powerful but also intuitive for those who don't want to learn, understand, and/or implement more advanced features." Appeagle also has a new look and feel, the option to automatically calculate a minimum price, integrated links to support articles, and new security features to help identify errors such as repricing to $0.01. Appeagle founders Koby Kasnett and Aaron Cohen were interviewed for a Web Retailer article in January 2015. The CEO of repricing software developers Appeagle has been interviewed for an in-depth article on the Web Retailer blog. How the business got started. How automated repricing has changed over the years. How they make sure Appeagle is reliable and bug-free. What makes Appeagle different, and what they have planned for the future. Amazon, eBay and Rakuten dynamic repricing tool Appeagle has announced new pricing to take effect from November 3, 2014. Pricing for existing customers will not change. Existing users can also upgrade their plan, and trial users can start subscribing, at the old prices until November 3rd. Appeagle's old pricing started at $25 per month and included all marketplaces, the new pricing starts at $50 per month for one marketplace. Amazon dynamic repricing tool Appeagle has enhanced its "Get the Buy Box" feature, and announced the development of more sophisticated repricing options. The Get the Buy Box feature provides a simple option to price listings based on the current Buy Box offer rather than complex profile settings.The feature has now been updated to raise listing prices as high as possible while still retaining the Buy Box. These features were previously available in Appeagle but withdrawn due to previous Amazon API changes. Soon after an FT article imagined a stock market-like price crash on Amazon, popular repricing software Appeagle malfunctioned and caused exactly that issue for a limited number of sellers, reports EcommerceBytes. The problem began when an update to Appeagle was released to address a new Amazon requirement. An error in a single line of code caused all listings where the seller had not entered a minimum price to be repriced to exactly one penny, and although the bug was fixed within 15 minutes, some of the affected products were purchased within that time. Affected sellers were able to cancel the one-penny orders and, according to Appeagle spokesman Zee Mehler, Amazon noted the issue on sellers' accounts and promised they would not be suspended from selling due to the order cancellations. Amazon and eBay repricing service Appeagle has simplified their pricing so all repricing "filters" are available on all price plans. Appeagle's price plans now differentiate only on number of listings and repricing interval. Amazon repricing solution Appeagle now works for Amazon UK. Appeagle say additional sites will be added in the coming months. 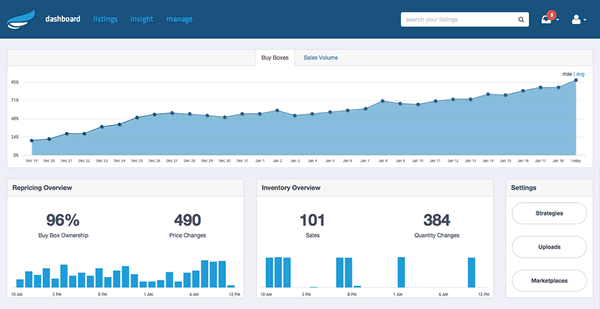 Appeagle manages inventory across eBay, Amazon and Buy.com and regularly analyzes the competition to reprice listings (shipping included). Auction Auto Bidder Online is a web based version of the Auction Auto Bidder PC software. Do you have news about Informed.co? Let us know.